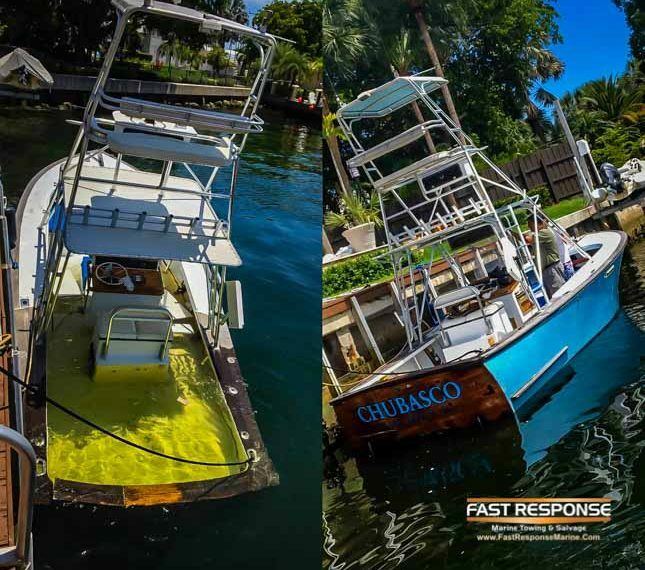 An unfortunate combination of events led to the dockside sinking of this beautiful little classic Chubasco 34 fishing boat, but we were happy to be able to salvage it for the owner. The single diesel engine had been sent out for rebuild, so the owner had the vessel towed to a dock to continue his restoration. After heavy rainfall one night, the boat sank. We certainly wish the owner success with his restoration. Be sure to check your bilge pumps and make sure your battery is topped up so this doesn’t happen to you!